Available for short-term rental: A unique 45 sq m alcove studio near Les Invalides and Rue Cler with a balcony view of the Eiffel Tower. Metro: La Tour Maubourg. You'll feel right at home in the "Gros Caillou"
Max 3 persons. Max 3 weeks. This bright studio, nestled in the "Gros Caillou" (Big Stone) neighborhood of the 7th arrondissement, is on Passage Jean Nicot. The cobblestoned, mostly pedestrian street connects Rue de Grenelle with Rue St. Dominique, and is a five-minute walk from the metro station, La Tour Maubourg. As you sit on the balcony and enjoy a glass of wine, you can take in the magnificent view of the Eiffel Tower, just a 15-minute walk away. The building across the way is only three stories high, allowing for lots of natural light and a feeling of openness that is unusual for Paris. The building is secure, with a code-locked exterior door, intercom system, and elevator. Wi-Fi internet is included, as well a stereo and a cable TV. On-site telephone is available for calls in France. Bed linens, blankets and towels are provided. The heat is radiator/hot water. The living room (20 sq m) has a large "French-style" windowed doors opening onto the balcony. There is wall-to-wall carpeting, and the room is furnished with a sofa bed, 2 armchairs, a dining room table, a coffee table, and shelves. The dining table, when extended, can comfortably seat six. There is a walk-in closet off the living room. • The sofa bed is appropriate for children 14 years of age or younger. 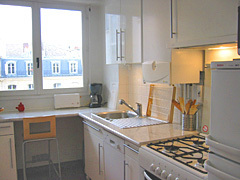 ﻿The kitchen﻿ (6 sq m) is separate, with a big window facing the balcony (view of Eiffel Tower), and a tiled floor. It is equipped with dishwasher, stove, refrigerator/freezer, microwave oven, toaster and coffee machine. The cook stove is "combination" style, with gas burners and an electric oven. The alcove, or bedroom/study, is 13 sq m with a window facing the Passage and balcony. It is adjacent to the bathroom. There are two twin beds which can be put together to be a king-size bed (70" wide x 74" long). The alcove is furnished with a desk, a couple of chairs and a bureau. The bed is not visible when entering the studio. 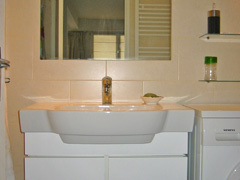 The bathroom is completely tiled, with shower, sink, and wall-mounted towel dryer. There is a washing machine, and a foldaway rack for drying. A hair dryer is provided. 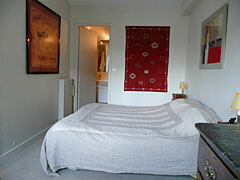 Please note that the rent prices are in dollars, and the service fee is in Euros. (14 years of age or younger) of $50 rent and €20 service fee. If your stay straddles two different pricing seasons, we will adjust based on per diem rates.